Strokes present in two manners. The first is ischemic stroke caused by a blockage of a large or small blood vessel to the brain. The second form, hemorrhagic stroke, is caused by bleeding of a blood vessel into the brain or on the surface of the brain as in subarachnoid spaces. Hypertension is the most common cause for stroke and intracerebral hemorrhage (ICH). Other causes of hemorrhagic stroke include a ruptured cerebral aneurysm, blood vessel abnormality, or a cardiac embolus (obstruction) usually from atrial fibrillation (A-fib). Also, all brain tumors can bleed into the brain appearing as intracerebral hemorrhage. Amyloid, a disease of the blood vessels, also can rupture and produce an ICH. The statistics are not good. Half of the strokes are ischemic (blockage) and half are hemorrhagic (bleeding). Half of the people with a stroke are dead within a year. So, it is obvious that what we used to do is not good enough. Evidence shows that if we are very aggressive with stroke patients, the mortality will decline significantly. The symptoms for a transient ischemic attack (TIA) are weakness or numbness of one to four extremities, loss of speech, double vision, and dizziness. If the symptoms last less than a few hours, they are transient; if longer than 24 hours, a permanent infarct results. Hemorrhagic strokes can present with a sudden onset of headache, nausea and vomiting from increased intracranial pressure or any of the symptoms or signs of an ischemic stroke. Regardless, these patients must be seen immediately by a physician or sent to the emergency room for rapid diagnosis and treatment. Hemorrhage can be seen easily on a CT scan. More details of ischemic stroke can be seen on MR examinations. MR angiography shows the blood vessels, aneurysms, AVMs, and tumors. Patients with ischemic strokes can be saved by rapid IV drug tPA administration and by interventional clot removal devices. For those with hemorrhagic strokes, if a treatable lesion is identified, surgery is a common choice for aneurysms, AVMs, tumors or blood clots. Interventional treatments for aneurysms and AVMs are another alternative. Neurologists, neurosurgeons and interventional neuroradiologists need to communicate on which treatment offers the lowest risk and the best outcome in each patient. The most troubling cases are those that cannot be completely managed with interventional treatments, leaving a partially treated vascular lesion in the brain. Consulting with a neurosurgeon who is knowledgeable about these choices is the first option. Referral to a major center where all these specialties exist offers the best alternatives for the patient. Many advances have been made in the treatment of ischemic and hemorrhagic strokes. So, time is of the essence in saving neurons by making the diagnosis quickly and efficiently. There is no time that is too late to refer the patient for immediate assessment. Many of these patients can improve with treatment, so act quickly and get the patient to a neurologist or neurosurgeon. Dr. Etebar and Dr. Ausman are neurosurgeons with Desert Spine and Neurosurgical Institute in Palm Springs and can be reached at (760) 346.8058 or www.desert-spine.com. They are also members of Desert Doctors. 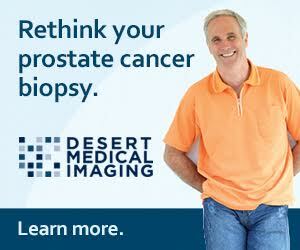 For more information visit www.DesertDoctors.org.